This week we're at Rio+20, the United Nations Conference on Sustainable Development. We're sharing a series of posts about our activities at the conference on the Green Blog; in this cross-post we've gone into more detail about one announcement taking place there. -Ed. Over three visits to the Surui territory between 2008 and last month, our Google Earth Outreach team taught Surui youth how to take photos and videos and to collect stories from their elders (such as from the time before first contact with the modern world). Then they learned how to upload these to the Google cloud using tools like Picasa, Docs, and YouTube. From there we used Spreadsheet Mapper 3 to bind it all together to create a Google Earth KML of their map, which contains almost 300 sites. Without the forest, our entire culture would disappear. And without our culture, the forest would have disappeared a long time ago. It’s important to live in a sustainable way and to strengthen those whose livelihoods directly depend on a healthy ecosystem. We have a 50-year sustainability plan, which includes solutions for our territory. An example is the Surui Carbon Project, which uses technology to monitor the carbon stock of forest and trade it in the market for carbon credits. Our hope is that we can come together virtually and in person, and that we can find and implement solutions together. It’s been a great honor for us to work with the Surui people and to experience their world view, especially to see how they blend their traditional knowledge and culture with modern technology. We’ve learned from Chief Almir that partnerships, consensus and collaboration are central; in that spirit, we’d like to thank our partners on this project: ECAM, Kanindé and Brazilian filmmaker Denise Zmekhol, who has documented the life of the Surui people for more than twenty years. You can watch a video of the tour or download it in English or Portuguese. 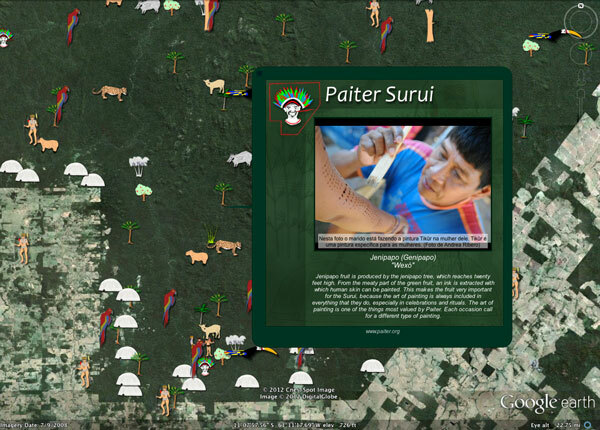 To learn more about the Surui tribe, known as “Paiter Surui,” please visit www.paiter.org. This entry was posted on Monday, June 18, 2012 at 10:25 AM and is filed under green, Latin America, maps and earth. You can follow any responses to this entry through the RSS 2.0. You can leave a response. Bear with us Kirkland, we’re almost done!